Well known western angler Mike Phua was on Lake Havasu practicing for a bass fishing tournament but nearly caught a world record in the process. Continue Reading, Near World Record. The trees decompose around pipes and concrete, helping them grow a skin of mosses and algae that serve as fish food. The artificial reefs also offer places for young fish to hide from predators. Continue Reading, Dumped Christmas Trees. Colorado River Smallmouth Bass Record. FLW Tour Pro Justin Kerr broke the Colorado River System Smallmouth bass record with a 5.63 pound fish from Lake Havasu on November 9th. Kerr used an Evergreen Combat Crank 480 in Bluegill color to entice the record-breaking fish. At 5.63 pounds, Kerr’s fish eclipsed the old mark of 5.39 pounds by almost four ounces. Continue Reading, Record Smallmouth. Redear Sunfish Caught At Lake Havasu has been Confirmed as a New Arizona State Record for Along the Colorado River. This huge redear (they feed on quagga mussels) tipped the scales at 5.55 pounds and was 16.75 inches long with a 19-inch girth. It was caught by Robert Lawler of Lake Havasu City on May 2 using a Texas-rigged 7-inch Power Worm. This huge fish may also be a contender for a world record as well. Continue Reading, Record Sunfish . Is Consistant Tournament Pressure Hurting Lake Havasu's Fishery? Will the constant pressure on the spawning fish during tournaments eventually effect the fishery. Already the Largemouth are being taken over by smallmouth which seem to do better there. 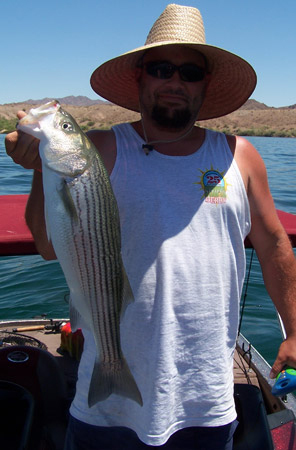 Continue Reading, "Is Consistant Tournament Pressure Hurting Lake Havasu's Fishery?" Zebra mussels (Dreissena polymorpha) are small, freshwater bi-valve mollusks (relatives to clams and oysters) that are triangular in shape with an obvious ridge between the side and bottom. The zebra mussel gets its name from the black- (or dark brown) and white-striped markings that appear on its shell. Continure Reading, "Quagga Mussels". Threadfin Shad Shows Promise as Forage Fish in Colorado Rivers and Lakes. The threadfin shad, a small prolific forage fish of Tennessee and other south-eastern States, has moved west and fishing in Lakes Mead, Havasu and Mojave and at other places along the Colorado River is getting better, according to reports reaching the Fish and Wildlife Service of the Department of the Interior. Continue Reading, "Threadfin Shad Shows Promise in Colorado River and Lakes".